Guru Guru - "30 Jahre Live ('98 Live)"
Guru Guru - "030 Jahre Live ('98 Live)"
Mani Neumeier has always been the undisputed leader of the Guru Guru clan, as drummer and lead vocalist. But most krautrock gurus (or guru-gurus) probably think most highly of the early 70s trio of Neumeier, Uli Trepte (bass), and Ax Genrich (guitar). (Personally, I favor the all-too-brief lineup with ex-Eiliff guitarist Houschäng Nejadepour, but maybe that's just me.) Since the mid-70s though, Neumeier has continued to lead some sort of Guru Guru-ish lineup, taking stabs at different styles from jazz to pop. Starting in the mid-90s, Guru Guru then became more coherent again and is making new albums again ("Wah Wah," "Moshi Moshi" and a new one upcoming) in a style more like they did in the old days, i.e., funky psychedelic-jazz-rock-fusion. In the meantime, somebody recognized that their 30th anniversary (since forming as Guru-Guru Groove in Zurich, Switzerland) had arrived and set out to put on a reunion show. The proceedings of this festival gig, the Finken Bach '98 festival in Odenwald Germany, were recorded of course and have now been released across two LPs... and I think I saw that it is also available as a 3-CD boxset from Captain Trip in Japan, including additional early 70s live recordings. The first LP features 45 minutes of the current Guru Guru lineup of Mani Neumeier (D,V) , Roland Schaeffer (G, Sax, V), Peter Kuhmstedt (B, V), and Luigi Archetti (G, V) plus a few guests. Then a whole orchestra of Gurus, including all of these musicians plus many more formed the Supersession group that was responsible for the entire second LP. Members of Can, Damo Suzuki's Network, Kraan, and Ax Genrich himself showed up to lend a hand. Apparently, Uli Trepte wasn't available or chose not to participate. Nearly all of the material on this 2-LP set is in the style of the old trio from 'Hinten' and 'Kanguru' days, meaning multiple lines of freakish guitar colorizing the funky-blues riffs that they were so fond of. But not many of these titles are very familiar to me, suggesting that they rehearsed and composed new material especially for this show (tracknames like "30 Years Celebration" and "Odenwald Riff" are a dead giveaway). So '30 Jahre Live' is hardly a Greatest Hits Live compilation, it's full of new and exciting material. On both LP's. The first side is quite diverse, from the Steppenwolf-ish "Der Euro Kommt" to the more Faustian "Idli Killer" and then on to the fabulous spaced-out "Space Baby" epic. This last one is a real winner....guest vocalist Razem Rhbel (apparently a recent ex-member) is given a writing credit and it's my guess we hear his voice on this one. Hans Reffert is also present on slide guitar (I surmised) and there's definitely a three-guitar army here... some plucking-style guitar, some droney rhythm guitar, and the soaring space-slide guitar. Quite fabulous. I'm also going to guess that Roland Schaeffer sings the tune that follows, i.e. his own "Incarnation Stomp," a jangle-riff blues-stomp with more of that slide guitar work. The second side has three familiar tunes. The title track from 'Moshi Moshi' has Neumeier taking over the vocal duties again, in addition to his ever-busy percussion work. As on many of the other songs, Schaeffer's sax parts have a peculiar nasal quality that give his instrument a real middle eastern sound... almost like an oboe. The bouncy, choppy and 'circular' riff of "Ooga Booga" comes next, where we find Mani choosing to throw in a 3-minute drum solo following up the free-for-all jam full of squealy synth effects and of course, the screamin' guitars. Part One wraps up with the familiar chugging bass of "Der Elektrolurch," Mani chanting out the words in German with a mocking tone - he also pulls out the 'duck' to play while letting his drums rest. The unit never fully rock out throughout the entire 12+ minutes, but they do present a lot of variations on the theme and the whole piece works very well. In addition to Genrich, the Supersession includes prominent guests Damo Suzuki and Michael Karoli, vocalist and guitarist of Can, respectively. And whether or not it's due simply to the power of suggestion, I'd argue that we do hear an intriguing 50:50 mix of the Rhineland-motorik sound and the Berlin-freakout sound on a number of cuts. Like on that "Odenwald Riff" I mentioned, but especially on "Canguruiam," a perfectly-titled number. The uptempo repetitive bassline and tom-heavy drumming (with additional percussion courtesy of two Network members) matched against (at least) three separate lines of untamed guitar - what else would you call it? Also, given Damo's continual ranting vocals, even the signature (Talking Heads-like) funky groove behind "The Ghost Of" was given a new flavor. "House of WahWah" sounds more like a circular 'round' based on the 'Voodoo Chile' blues riff, but I was grooving to it regardless of how it evolved. Like some other tracks, this one is faded out suggesting that they might have played long enough for three entire LP's, but I'd argue the editing probably helped it to be more easily consumed by the listener. The finale "The Owls Go To Bed" is an 11-minute psych-guitar extravaganza... the chugga-chugga riffing countered by (once again) many lines of jangly, droney, glissando guitar...you name it. Mani jumps in and out of the picture on the drumkit, and eventually the whole unit builds up to a climax about eight minutes in. Eventually the Supersession winds down and we catch some of the band introductions as the LP fades to black. Well, I'm inclined to say that this is a surprisingly excellent album. But I haven't heard any Guru Guru that wasn't top notch stuff (granted I don't have anything from the 80's), so I suppose it's not so surprising. However, there's always the concern that a reunion show of this sort wouldn't turn out to be the perfect time-travelling experience to decades gone by, but rather a sorry reminder that twenty-some years of rust prevents once proud rock icons from recapturing lost glories. (I've seen it happen.) Thankfully, nothing like that happened here. Maybe it was because some of the old krautrock veterans were from outside the Guru Guru camp and so an automatic freshness was instilled? 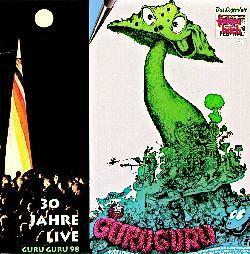 Whatever, '30 Jahre Live' is an essential krautrock recording, not to be taken lightly as just another 'for collector's only' item. The artwork and photos that adorn the gatefold sleeve are really nice also, even if (Die Krupps') Jhrgen Engler's liner notes are poorly translated/proofread. You can visit their web site at http://www.innerspacerecords.com.